Pickerington Schools is in the process of developing a Plan for Progress that will provide a roadmap for the future of the district, ensuring that we are attaining greater levels of efficiency, reaching a higher level of community trust, and graduating students that are prepared for today’s world. What is the Plan for Progress? The Plan for Progress is a connection between schools and community that reflects resident and staff input, values, and priorities. The plan is a contract with our community to ensure Pickerington Schools offers a high-quality education while operating in an efficient manner. The Plan for Progress will provide a roadmap for the future that ensures we are attaining greater levels of efficiency, reaching a higher level of community trust, and graduating students that are prepared for today’s world. What must we do to engage all of our students in relevant and rich learning experiences that will prepare them for career, college and life? What can we do now to maximize resources and ensure the school district is operating efficiently? Do our facilities reflect the environment needed to be successful in today’s world? If not, name some ways we can improve? How Is the Plan Being Developed? 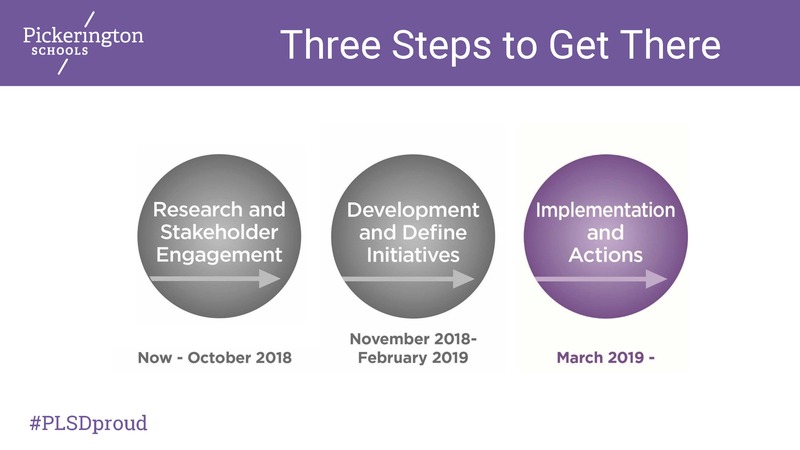 There are three phases to developing this plan. 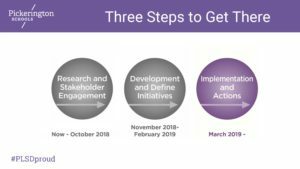 Phase One of the Plan for Progress began in spring 2018 and wrapped up in October. Via a Community Survey and a survey of district employees, we gathered data and collected feedback and ideas from our internal and external stakeholders. The district currently is wrapping up Phase Two of the Plan for Progress. The initial plan was presented to the Board of Education at its February 25, 2019, meeting. You may view the video of the initial plan presentation at the Board meeting, along with the PowerPoint slides and an update video from Dr. Briggs under the “Plan for Progress Update” section on this webpage. As part of the Phase One of the development of Pickerington Schools’ Plan for Progress, Superintendent Chris Briggs and other members of the district’s administration hosted two community meetings in Sept. 2018. The events gave Dr. Briggs and his team a chance to explain the status of Plan for Progress, while also soliciting opinions and questions from those in attendance. Implementation of the plan will begin in March. Kati Mullett is an intervention specialist at Toll Gate Elementary, but she also has a child in kindergarten and another who will be going to Pickerington Schools in a few years. Having spent 13 years teaching at Pickerington, she sees Plan for Progress as a positive step for the district. She is glad to have the opportunity to give the district input.